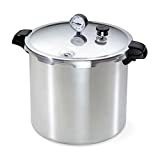 The Presto 01781 23-Quart Pressure Cooker is ideal for all your home canning needs, with more than sufficient space for your 6 Mason Jars. The Presto 01781 only takes up as much space as a large pan and fits comfortably on both gas and smooth-top (electric) hobs. This model has been a long-time best seller on Amazon, usually under $100 (see lowest price). The U.S Department of Agriculture (USDA) stated in the ‘USDA Complete Guide To Home Canning’ that the only safe method for canning low-acid foods (vegetables, fermented food, poultry, seafood and meat) is pressure canning. Which makes us all the more fortunate that Presto have once again come up with another genius invention set to help us retain flavour in our food. The Presto 01781 is also good for preserving fruits, jams, jellies, pickles and salsa by boiling water underneath the helpfully-supplied rack that the canning jars can be placed on. Not to mention that it doubles up as a pressure cooker. The Presto 01781 is a dependable kitchen appliance, only helped by the fact that it is formed from warp-resistant aluminium (so that the helpfully slim shape is retained while heating the inside both quickly and evenly), the lid is made from steel, the air vent/cover lock is present to give you peace of mind (the appliance won’t turn on/re-open until the correct pressure is obtained), the inner sealing ring helps to create an airtight environment for maximum efficiency and the overpressure plug prevents you, and your family from burning yourselves when you go to open the canner/pressure cooker when it has done its job, very well might I add. Upon receiving the Presto 01781 I was, at first, nervous. But I soon read the instruction manual and so many more things made sense, such as ‘the fact that the vent pipe is clear won’t stop the canner/pressure cooker from rocking from side to side but this is normal’. I followed the recipe and safety instructions step by step, making sure that my Mason jars were closed, sealed and didn’t touch the bottom of the canner (which would cause them to crack) before sealing the canner and turning on the range. After thirty minutes I came back to see if my vegetables were canned (I had chosen to can carrots) and, lo and behold, they came out perfectly. I carefully removed the Mason Jars, inspecting them for cracks/leaks/spills etc. but there wasn’t a single issue with one of them. Thoroughly impressed by the capability of this innovative machine, I happily put my carrots in the cupboard and immediately readied myself to make use of the pressure cooker function to make the family some dinner (to my immense pleasure there was, indeed, a recipe for a hearty pot roast – 15-18 servings in fact). I’ve used the Presto 01781 daily since that time without fail (I’ve found that the canner can actually hold 7 Mason Jars quite comfortably) and have not once been disappointed. The way it retains moisture in food, the extra-large size which allow me to prepare meals and lunches in advance after having cleaned it out from canning and the fact that I’m no longer limited to only canning jams and preserves because, although that can be done – you can also carry out boiling water canning in the Presto 01781, I must admit I love the fact that I’m able to can crab (it’s a personal favourite of mine). And if I ever felt the existing safety features: deluxe pressure dial gauge that registers the complete range of processing pressures, stay cool handles, strong lock lid, which only allows me to open it when it’s completely safe to; the overpressure plug that further minimises the risk of scalding and other burns, and the inner sealing ring, so only controlled amounts of steam are released at the appropriate time; weren’t enough, then the extended 12 year limited warranty shows just how much faith Presto has in their product and consequently, how much faith I now have in it having used it day in, day out with it still continuing to give me faultless results. I certainly can’t complain. 23 Quart Capacity, I can can a high quantity of food items at once (sometimes more than one type of food e.g. potatoes and cut up meat), more than I thought I would ever be able to before the Presto 01781. Stay-Cool Handles, put plainly, these handles have prevented me from injuring myself more times than I can count. Overpressure Plug, the controlled release of steam before I can open the lid makes me that much more confident about my meals (at least that they are not about to blow up in my face). Warp-resistant, heavy-gauge aluminium, I always found it difficult to get evenly heated food with other pans and cookers before I invested in the Presto 01781. The Presto 01781 is a budget pressure cooker that doesn’t compromise on build quality or cooking quality. If you simply want a canner that delivers great tasting food, then don’t look any further than the Presto 01781 pressure cooker. Click here to see what other customers are saying about the Presto 01781.. The Presto 01781 is undoubtedly the wisest investment I’ve ever made. I got both a cooker and canner for one price, and because I can now can without being forced to rely on boiling water all the time I can finally can more than just fruit, which has put an end to my children having a reason to eat less vegetables whenever they’re out of season (we only eat organic) and so become too expensive to buy. The 70 page instruction/recipe book is still giving me new daily meal ideas and the food I’ve canned seems to taste better than anything I’ve bought at the store before. Why don’t you give it a try for yourself? The Presto 01781 is an affordable pressure cooker that simply delivers quality. It doesn’t heat up as much as other canners, but they are often hundreds of dollars more expensive. The Presto 01781 is perfect for shoppers on a budget! I just bought my preso 23 quart and I also have a brand new electric stove. it literally took me 1 hour and 20 minutes to even get the steam coming out of the little area I put the bobber on. then it tlook me about 15 min to get my pounds up to 11. when it was all don we are looking at 2 hours. then the water in the beans looks almost brown. my god something is wrong here. it is a brand new Samsung stove. not cheap. do I have a defective stove. what else could I be doing wrong? In my experience, electric stoves just don’t put out the BTUs that gas stoves do. Also, it depends on your setup. Were any (all of…?) the following cold: the canning jars, the lids, the rings, the 3 quarts of “steam water”, the water in your canning jars, the product in your canning jars? Also, did you load it up with 18 pint jars? If you answered ‘yes’ to 3 or more things, then you know where you went wrong. How about the aluminum poisoning the food? I do know that their are MANY MANY warnings out about cooking in Aluminum pots and the resulting bad effects it has on the health of human beings. Is this a problem with this pressure cooker? For your concerns pertaining to Aluminum ingestion.